Maria Eugenia Farias and her colleagues from Laboratorio de Investigaciones Microbiologicas de Lagunas Andinas (LIMLA) invites students and professionals interested in microbialites to take part in field school “Microbialites of the Puna: the study and interpretation of organosedimentary facies in the stratigraphic record and modern analogues”. Microbialites are “organosedimentary deposits that have accreted as a result of a benthic microbial community trapping and binding detrital sediment and/or forming the locus of mineral precipitation” (Burne and Moore, 1987). Similar fossilized structures provide records of ancient life on Earth. Field school will provide unique opportunity to visit Andean saline lakes, fossilized and modern layered structures. Unit I: Definition of microbialite. Identification of organo-sedimentary facies. Classification of microbialites. The “boom” of its importance in science. Unit II: Introduction to geomicrobiology. Applications. Microbial degradation of hydrocarbons. History of the Earth and astrobiology. Minerals precipitated microbially. Extremophiles. Unit III: The architecture of microbialites in a deposit. External morphology: paleoenvironmental classifications and implicaons. Stromatolyc facies as guide horizons. Examples in the geological record. Palaeoenvironmental reconstructions. Unit IV: Microbialites as biological components of relevance in the wetlands and salt flats of the Puna. Monitoring and environmental surveys in the context of lithium mining. Legal implications. Unit I: Carachipampa volcano and Laguna Carachipampa (hydrothermal sources of sulfur, stromatolyc platforms and oncolites structures). 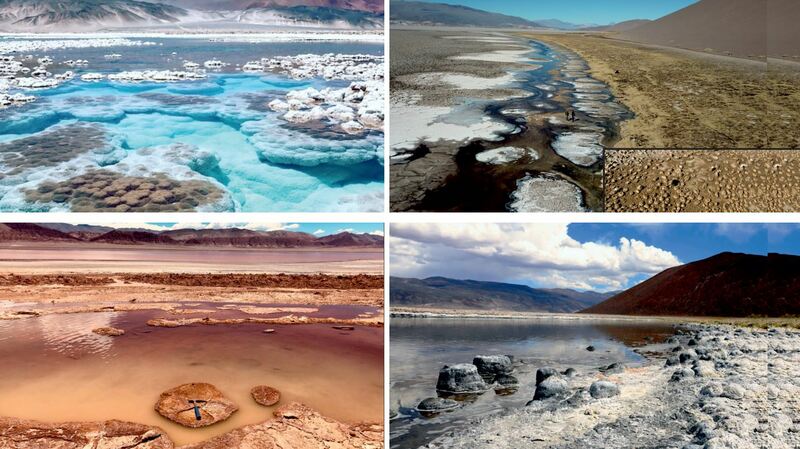 Unit II: Salt of Antofalla: Pozo Bravo (domic and platform microbialites), Ojo Bravo (microbial biostromes), Las Quínoas (oncolites structures) and Laguna Verde (evaporics). Unit III: Tolar Grande: Ojos de mar (microbial biostromes). Unit IV: Maimará: Yacoraite Formaon (fossil stromatolites of the Maastrichan-Danian). Unit I: Internal morphology: classifications and paleoenvironmental implications. Macrofábrica. Microfabrica and mineralogy. The relationship between cyanobacteria and the morphology of a microbialite.